Man, who else has a case of the Januaries? I know that a new year is supposed to bring a whole host of new resolutions and new goals, but honestly, I'm just exhausted. Screw work, screw blogging and screw going to the gym. All I want to do is put on my polka dot sweatpants, camp out on my couch and watch episode after episode of Friends while drinking red wine and eating dark chocolate. It turns out that red wine and dark chocolate are some of the only indulges I can have on this pesky new low-carb diet that I'm on. Ugh, I know, I said the d-word... but honestly after a week straight of eating three awesomeepicdelicious cookies a day and a mostly food-related trip to Texas, it was much needed. Don't let my Instagram fool you — currently my life is filled with nothing but spinach salads and eggs (which is probably why I've got such a bad case of the Januaries). But oh well. At least I can still have red wine and dark chocolate. 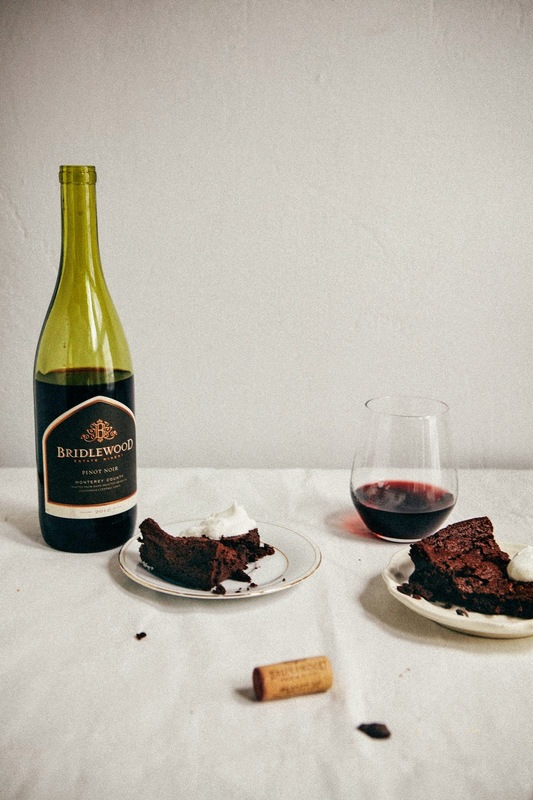 A few months ago, Bridlewood Estate Winery asked me to create a recipe that would pair well with their pinot noir. I don't have much of a wine palette, but Bridlewood's wine definitely brought to mind fruit flavors like raspberry and cherry, but a little bit more tart and almost peppery. I thought that this little bit of a kick would go well with dark chocolate, as well as bring out the hints of caramel and toffee in the wine. 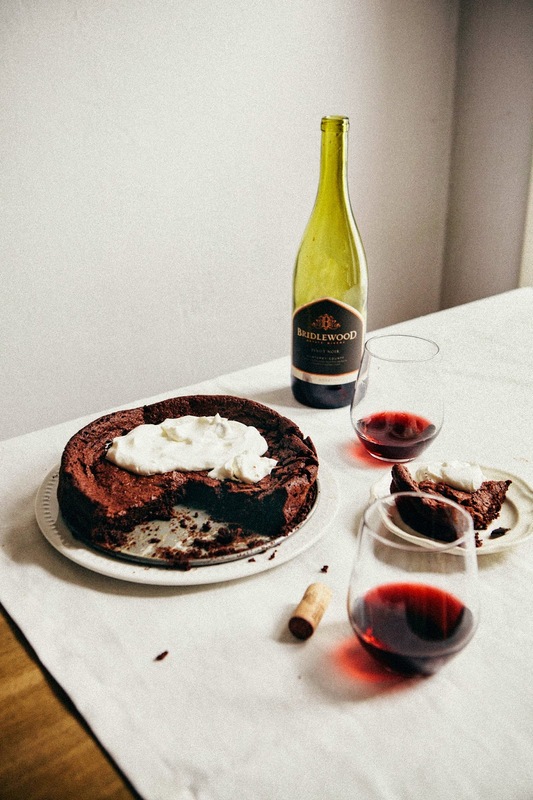 To keep the wine and dark chocolate pairing as pure as possible, I combined the two in a flourless Swedish chocolate cake recipe. 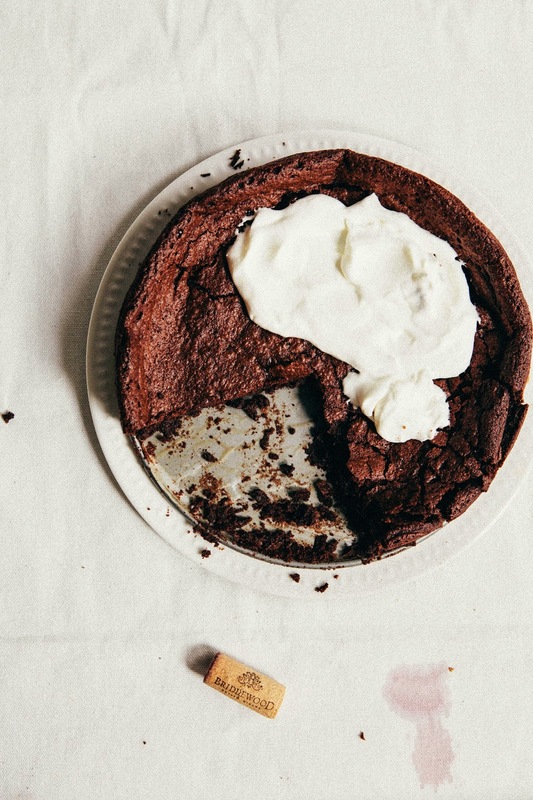 Apparently incredibly moist, gooey chocolate cakes are a staple in the country — its Swedish name is "kladdkaka", which translates roughly to "gooey" or "sticky" cake in English. All though there are many variations of the recipe available, the basic premise is the same: a chocolate cake made without any leavening of any kind, resulting in a brownie-like cake with a soft, gooey center. 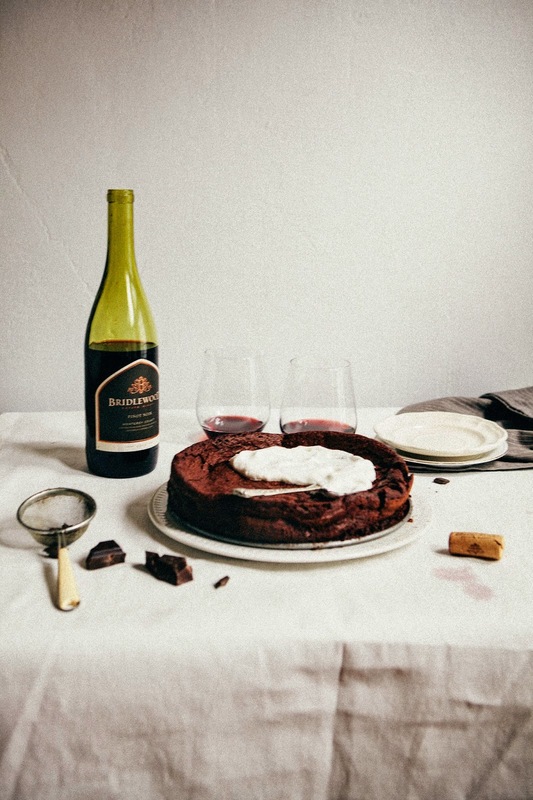 In this case, red wine was added to the cake to keep it moist and gooey while giving it a hint of boozy, fruity goodness. Because this cake doesn't use any leavener, it's really hard to tell when it's finished baking in the oven. Even though it looks like it's finished baking, be sure to cook it for the exact time that I listed in the recipe! Also, it's completely normal for the cake to sink in the center and kind of give off a flaky, crusted top (see Swedish blogger Call Me Cupcake's version, or Top With Cinnamon's) because of the lack of leavener in the cake — so don't panic if that happens! Preheat the oven to 350 (F). Prepare a 9-inch springform baking pan by spraying liberally with cooking spray and lining the base with parchment paper. Spray the parchment paper. In a double boiler (or a heatproof bowl set over a pan of boiling water, ensuring that the bottom of the bowl does not touch the water), combine 1 cup unsalted butter and 8 ounces coarsely chopped dark chocolate. Melt, using a heatproof rubber spatula to stir occasionally. When both the butter and the chocolate are fully melted, remove from heat. Gently whisk in 1/3 cup red wine, and set on a wire rack to cool slightly. In the bowl of a freestanding electric mixer fitted with a whisk attachment, combine 4 large eggs, 3/4 cup granulated sugar, and 1 teaspoon pure vanilla extract. Whip on medium-high speed until very light and fluffy, at least 5 minutes. Once the egg and sugar mixture is light and fluffy and has doubled in size, gently fold the cooled chocolate mixture (from the 2nd step) into the egg and sugar mixture until the batter is fully incorporated and is a uniform chocolate color. Transfer the batter to the prepared springform pan and bake for 35 to 40 minutes. Transfer the cake to a wire rack to cool for 10 minutes, before running an offset spatula or butter knife around the cake pan. Remove the side ring of the pan from the cake, and allow to cool on the wire rack. Serve with fresh whipped cream. As the cake cools, it will deflate and sink slightly — a fresh, warm cake will have a chocolate lava cake texture, while a cool cake will have a dense, brownie-like texture. Do not give up Michelle! Those spinach and vegetable bundles are making you more beautiful ;) however I like you are still eating dark choc and red wine. The most sensible thing I have ever heard in long time. This is such a work of art and so simple too! The chocolate intensity you captured is mouthwatering! Thanks Belinda!!! This is the first time I've ever been on a diet — my blog has finally caught up with me! But it's not so bad if I can still eat dark chocolate and red wine, right? I feel you on this being a rough month! I was JUST perusing dessert recipes for this weekend. I think I found the winner! The red wine in this is absolutely FAB!! Definitely need to try! Print button doesnt work, for some reason! Looks amazing and i clearly want to make it really soon. Yessss. Let's hang out soon! Hahah, can we make January nap month? And then when we wake up, you can make Korean army base stew and I'll bring this chocolate cake. Sounds like a good game plan, yeah? Oh nooooo! Thanks for letting me know, I'm fixing it now. I love the rich colour of this cake...I bet the taste is as divine! Good lord this sounds amazing and looks incredible. I'm with you on the D-word. Mostly just the "please don't eat sweets and fats at least for today" diet. It's getting me through my holiday crack sugar cookie addiction. Good luck to you. Ugh, yes. I still expect myself to feel refreshed and full of energy after a break over Christmas but the reality is I'm even more exhausted than I was before. I'm all for making January nap month. I'm also on one of those dreaded D-things to try and shift a few pounds before I start looking for a wedding dress and it's the most tedious thing ever. I definitely need a slice of this gorgeous cake in my life asap. Would it be all right to use a higher percentage of the dark chocolate? Hahha, that's actually what my diet is: "Don't eat all the free bagels in the office, and stop eating snacks." UGH I'm still so annoyed we missed each other! YES. Tedious is a good way to describe dieting. It's my first one ever, and I pretty much hate it. But WEDDING DRESS SHOPPING AHHHHH how excited are you?! Yes, but it will likely make the cake more bitter. Be sure to use a sweeter red wine if you do so. Thanks, Michelle. Maybe I will use a dessert wine. UM. Is it sad to say that I'm the girl who has a bunch of red wine left over all the time because people bring it to parties and then leave it, and I don't drink it? :( still, I'm soooo so glad you're sharing this now--hooray for revitalizing and reappropriating le wine! I want to have some, yummy, moist cake. No shame in that... I actually do the same thing! Most of that leftover wine ends up as cooking sauce for dinner, but occasionally I use it in desserts like this one. Oh, the Januaries. Well said. I think making this through the Februaries would also be helpful! Such a beautiful cake. Can't wait to make this very soon! This cake sounds amazing! 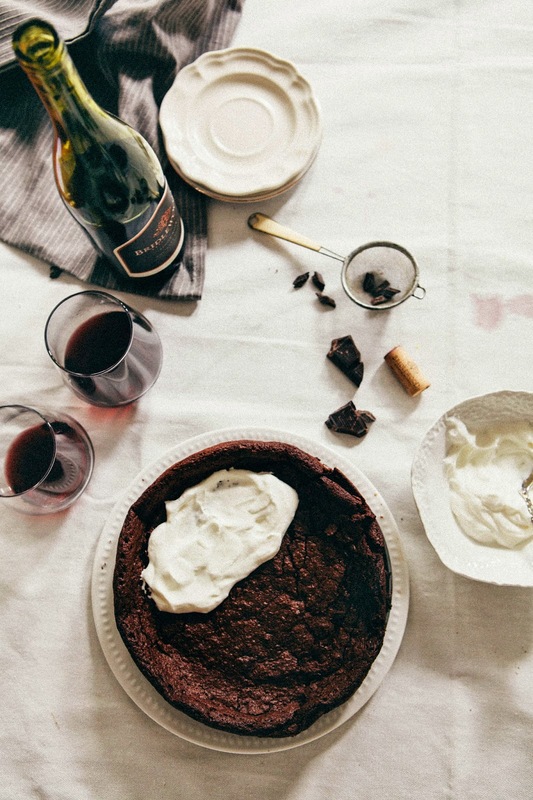 I don't think I've ever eaten a cake with red wine in it before. Time to fix that! Omomomomo girl! You rock in the kitchen, absolutely!!! Yay for Swedish chocolate cake!! And boo to January - it's the worst. It's also super cold outside so it does NOT help me with motivation to leave the house. All I wanna do is gorge on food so I can then hibernate until April. These photos, Michelle! They're perfection! Could you use another oil instead of vegetable oil? Perhaps coconut oil? This is just my kind of cake. Chocolate and red wine gotta be one of my favorite combination. Totally making it as soon as possible, thanks for sharing! I totally feel you; I'm emotionally and physically exhausted at the moment. I miss the sun. I need some days off from work and blogging. And I need chocolate. And cake. Okay, and red wine. 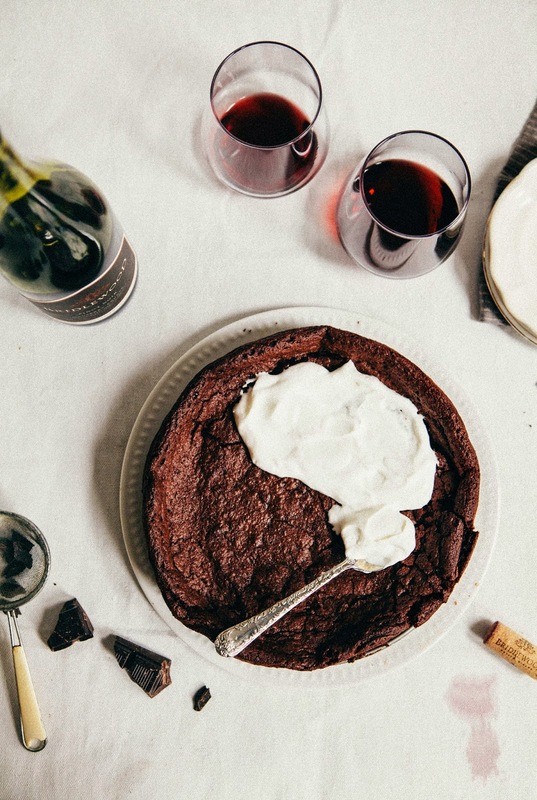 As you said, chocolate and red wine are a pair made in heaven! I'm sure your take on kladdkaka tastes excellent. We have a dream of moving to Sweden. Now that I know they eat a lot of flourless chocolate cake, I'm ready to go right this minute. Kate!!! I didn't know that you read my blog! This is such a blast from the past!!! Thanks for trying one of my recipes! I'm currently making this cake for my roommate's birthday. Thanks for the great recipe! My mom used to make this cake when I was growing up. It truly is delicious. just wondering if you've tried using blood oranges in your attempt to recreate the red velvet cake, blood oranges have a deep crimson color which would add to the red color of the cake and also give it an orange flavor. No, but that sounds like a great idea!!! Definitely going to give that a try the next time I make red velvet cake! I used orange extract instead of orange liqueuor (just cheaper). Cake came out delicious & moist. After making the frosting, I decided I wanted it a bit sweeter and bolder. Added 1/2 cup more of powdered sugar and a splash of orange extract. Loved the salt in the frosting. An easy, yummy, sophisticated dessert. Hi, I just wanted to drop in and give this cake two thumbs up! I only made the cake part because I needed it to practice decorating with fondant. Took it to work and left before my coworkers ate it, but now whenever we have cake/cupcakes at the office they tell me that this cake was better, haha!